The stay-tab opening mechanism characteristic of post-1970s drinking cans. A beverage can (or drinks can) is a can manufactured to hold a single serving of a beverage. In the United States, the can is most often made of aluminum (almost entirely), but cans made in Europe and Asia are an alloy of approximately 55 percent steel and 45 percent aluminum. Aluminum is a widely available, affordable, lightweight metal that is easy to shape. Also, it is far more cost-effective to recycle aluminum than to extract it from its ores. However, many consumers find that a drink from a can has a different taste compared to drinks from a fountain or glass bottle. Although an aluminum can has an internal coating to prevent the contents from directly contacting the aluminum, the internal coating occasionally fails, and the contents may then create a hole, causing the can to leak. 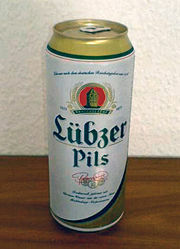 Lübzer Pils beer from Germany in the larger European standard can size of 500 mL (17.6 imp fl oz/). The early metal beverage can was made out of steel (similar to a tin can) and had no pull-tab. Instead, it was opened by a can piercer, a device resembling a bottle opener, but with a sharp point. The can was opened by punching two triangular holes in the lid — a large one for drinking, and a small one to admit air. This type of opener is sometimes referred to as a churchkey. With further advancements, the ends of the can were made of aluminum instead of steel. Shasta claims to be the first soda company to can their beverages. Early cans in the United States included what were known as cone tops and crowntainers, which had tops that were conical, rather than flat. Cone top cans were sealed by the same caps that were put on bottles. There were three types of conetops —high profile, low profile, and j-spout. The low profile and j-spout were the earliest, dating from about 1935, the same as the flat top cans that had to be opened with an opener. The crowntainer was a different type of can that was drawn steel with a bottom cap and the favorite of some collectors. Various breweries used crowntainers and conetops until the late 1950s, but not every brewery used every variety mentioned here. Crowntainers were developed by Crown Cork & Seal, now known as Crown Holdings, Inc., a leading beverage packaging and beverage can producer. The first all-aluminum cans were the same as their forebears, which still used the can opener to open them. Mikolaj Kondakow of Thunder Bay, Ontario invented the pull tab version for bottles in 1956 (Canadian patent 476789). Then, in 1962, Ermal Cleon Fraze of Dayton, Ohio invented the similar integral rivet and pull-tab version (also known as rimple or ring pull), which had a ring attached at the rivet for pulling, and which would come off completely to be discarded. He received U.S. Patent No. 3,349,949 for his pull-top can design in 1963 and licensed his invention to Alcoa and Pittsburgh Brewing Company. It was first introduced on Iron City beer cans by the Pittsburgh Brewing Company. The first soft drinks to be sold in all-aluminum cans were R.C. Cola and Diet-Rite Cola, both made by the Royal Crown Cola company, in 1964. Pull-tabs were a common form of litter. Some users dropped the aluminum tab into the can and occasionally swallowed the sharp-edged tab by accident. Stay tabs (also called colon tabs) were invented by Daniel F. Cudzik of Reynolds Metals in Richmond, Virginia in 1975, partly to prevent the injuries caused by removable tabs. In this can model described in U.S. Patent No. 3,967,752, the lid contains a scored region and a pull-tab that can be leveraged to open the hole by pushing the scored region into the can. Stay tabs almost completely replaced pull-tabs in many parts of the world by the early 1980s, though pull-tabs are still common in places such as China and the Middle East. One unsuccessful variation was the press-button can, which featured two pre-cut buttons, one large, one small, in the top of the can, sealed with a plastic membrane. These buttons were held closed by the outward pressure of the carbonated beverage. To open the can, the consumer would press both buttons into the body of the can, thus opening one through which to drink the beverage, the other to provide sufficient air to allow the contents to flow more easily. The buttons would remain attached to the can, alleviating the earlier issues with pull-tab ingestion. A disadvantage of this method was that a consumer could open a press button can and either remove, replace or taint its contents, before shaking the can enough to force the press buttons to re-seal the can, with little evidence of tampering. Another disadvantage was that it was too easy for consumers either to cut themselves on the sharp edge of either hole or get fingers stuck inside the can whilst pressing the buttons to open it. Most beverage cans have a slightly tapered top and bottom. The metal on the lid of the can is significantly thicker than the metal on the sides. This means that a great deal of raw materials can be saved by decreasing the diameter of the lid, without significantly decreasing the structural integrity or capacity of the can. The most recent advance in can design has been the "wide mouth" can: the opening was initially enlarged in the late 1990s by Mountain Dew. In 2000, Crown Holdings, Inc. introduced an improvement in beverage end technology, named SuperEnd. The geometry reduces the aluminum content by ten percent and creates a 'billboard' area, usable for brand logos and special messages. In North America, the standard can size (capacity) is 12 U.S. fluid ounces (355 ml/12.5 imp fl oz). In India and most of Europe, standard cans are 330 ml (11.6 imp fl oz/11.2 U.S. fl oz). In some European countries there is a second standard can size, 500 ml (17.6 imp fl oz/), often used for beer (roughly equal in size to the non-standard American 16 fluid ounce "tall boy," also often used for beer). In Australia, the standard can size is 375 ml (/13.2 imp fl oz). South African standard cans are 340 ml (12.0 imp fl oz/), although the industry is (as of September 2007) converting to the European 330 ml standard and the promotional size is changing from 450 ml (15.8 imp fl oz/) to 440 ml (15.5 imp fl oz/). Cans come in varying heights and diameters to encompass the range of capacities currently in use, but the diameters are usually one of two standard sizes. The United States, Australia, and New Zealand almost universally use a diameter slightly in excess of 65mm. This size is almost universal in these countries for soft drinks, beers, and ready-mixed spirit drinks. European countries mostly use a much narrower size of 52mm for soft drinks and some beers. Recently, the European size has started to appear in the US and Australasian markets with the appearance of energy drinks such as Red Bull (which is of European origin). One practical difficulty brought about by these two differing standard sizes is that cans manufactured in Europe (with the smaller size cans and holders) and exported to the US or Australasia (who use the larger size) often present their owners with cup holders that are incapable of holding most drinks in those countries. All metal beverage cans made in the United States are manufactured from aluminum, whereas drink cans made in Europe and Asia are approximately 55 percent steel and 45 percent aluminum alloy. An empty aluminum can weighs approximately a half-ounce (15 g). There are roughly 30 empty aluminum cans to an avoirdupois pound (450 g). Modern cans are generally produced through a mechanical cold forming process that starts with punching a flat blank from very stiff cold-rolled sheet. This sheet is typically alloy 3104-H19 or 3004-H19, which is aluminum with about one percent manganese and one percent magnesium to give it strength and formability. The flat blank is first formed into a cup about three inches in diameter. This cup is then pushed through a different forming process called "ironing," which forms the can. The bottom of the can is also shaped at this time. The malleable metal deforms into the shape of an open-top can. With the sophisticated technology of the dies and forming machines, the side of the can is significantly thinner than either the top and bottom areas, where stiffness is required. One can-making production line can turn out up to 2400 cans per minute. Plain lids are stamped out from a coil of aluminum, typically alloy 5182-H49, and are transferred to another press that converts them to easy-open ends. The conversion press forms an integral rivet button in the lid and scores the opening, while concurrently forming the tabs in another die from a separate strip of aluminum. The tab is pushed over the button, which is then flattened to form the rivet that attaches the tab to the lid. Finally, the top rim of the can is trimmed and pressed inward or "necked" to form a taper conical where the can will later be filled and the lid (usually made of an aluminum alloy with magnesium) attached. One problem with the current design is that the top edge of the can may collect dust or dirt in transit, if the can is not packaged in a completely sealed box. Some marketers have experimented with putting a separate foil lid on can tops, and shipping cans in cardboard 12 or 24 pack cases. Many consumers find the taste of a drink from a can to be different from fountain drinks and those from plastic or glass bottles. In addition, some people believe that aluminum leaching into the fluid contained inside can be dangerous to the drinker's health. The exact role (if any) of aluminum in Alzheimer's disease is still being researched and debated, though the scientific consensus is that aluminum plays no role in development of the disease. Aluminum cans contain an internal coating to protect the aluminum from the contents. If the internal coating fails, the contents will create a hole and the can will leak in a matter of days. There is some difference in taste, especially noticeable in beer, presumably due to traces of the processing oils used in making the can. In many parts of the world, a deposit can be recovered by turning in empty plastic, glass, and aluminum containers. Unlike glass and plastic, scrap metal dealers often purchase aluminum cans in bulk, even when deposits are not offered. Aluminum is one of the most cost-effective materials to recycle. When recycled without other metals being mixed in, the can/lid combination is perfect for producing new stock for the main part of the can. The loss of magnesium during melting is compensated by the high magnesium content of the lid. Also, the refining of ores such as bauxite into aluminum requires large amounts of electricity, making recycling cheaper than smelting. A can of San Pellegrino Aranciata, with a separate foil lid. A pull tab from the 1970's. ↑ William S. Hammack (1999), Stomp on it! Speech to the University of Illinois Senior 100 Engineer Guy. Retrieved August 3, 2008. ↑ The Stay-On-Tab Designed by Dan Cudzik on a Reynolds Metals Co. Aluminum Can The Library of Virginia. Retrieved August 3, 2008. ↑ Easy-Open Wall. U.S. Patent No. 3,967,752 1976-07-06 Google Patent Search. Retrieved August 3, 2008. ↑ Terence Turner, Canmaking For Can Fillers (Boca Raton, FL: CRC Press, 2001, ISBN 0849397871), 23. ↑ Rudolph Valentino Snopes. Retrieved August 3, 2008. ↑ Leonard Berg, Zaven S. Khachaturian and Charles DeCarli (1997), Ask The Experts: Medicine - Is there any proof that Alzheimer's disease is related to exposure to aluminum—for instance, by using aluminum frying pans? Scientific American. Retrieved August 3, 2008. ↑ ToxFAQs for aluminum US Center for Disease Control, Agency for Toxic Substances and Disease Registry, Information Center (1999). Retrieved August 3, 2008. This page was last modified on 4 June 2016, at 16:57.